The 5th and final week of Stage 4 of the Overwatch League is knocking at the door. 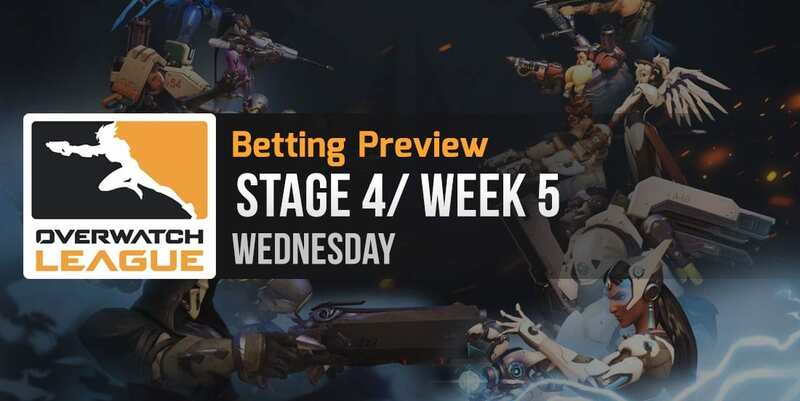 Just 12 more matches are left to be played until the end of the regular season and the Overwatch betting opportunities they present are remarkable. This article analyzes these opportunities, giving you an analysis of the matches. Los Angeles Gladiators has had the best stage so far in the Overwatch League, losing just 1 match against Los Angeles Valiant and winning the other 7, some of them against formidable opponents such as New York Excelsior. A top 4 finish for Gladiators is guaranteed at this point, but I’m sure the team will want to place as high as possible. In particular, a 1st place finish would almost certainly allow it to dodge New York Excelsior in the Semifinals of the Stage 4 Title Matches. Another week, another 2 guaranteed losses for Shanghai Dragons, a team that’s currently holding an undisputed record for the entire field of esports: 38 losses in a row. No doubt, the end result will be 0 V – 4 D for Dragons, as its final two opponents are very strong teams. Someone should really make a documentary about these guys as their journey during the Inaugural Season of the Overwatch League has been the stuff of legend. Needless to say, Los Angeles Gladiators is several tiers above Shanghai Dragons in every respect. Regardless of what statistics you want to look at, this match should be an easy 3 – 1 or 4 – 0 victory in favor of Gladiators. Betting prediction: Los Angeles Gladiators at BetOnline. After a 7 W – 3 L record and a 3rd place finish in Stage 3, Los Angeles Valiant improved its playstyle and has crushed everyone so far in Stage 4. The team is currently sitting at the top of the league, even though it has already faced some of the other main contenders. Both New York Excelsior and Los Angeles Gladiators were defeated by LA Valiant in the previous weeks, a sign which clearly proves this version of the team is much stronger than any of the previous ones. After transferring in the head coach of Boston Uprising, San Francisco Shock sought to improve its Stage 3 results even more, but unfortunately hasn’t managed to accomplish that goal. Without any doubt, Shock is headed towards a 5 V – 5 D result in Stage 4. From head to head (4 – 0) to recent form results, every single type of indicator points towards a Los Angeles Valiant victory in this match. Betting prediction: Los Angeles Valiant at BetOnline. Seoul Dynasty hasn’t had a very good run in Stage 4, winning just 2 of its matches and against completely irrelevant opponents: Shanghai Dragons and Florida Mayhem. Throughout the entire duration of the Overwatch League, Seoul Dynasty has been one of the fairly strong teams, finishing Stage 1, 2 and 3 in 5th (7 V – 3 D), 4th (7 V – 3 D) and 7th (5 V – 5 D) place respectively. In Stage 4, Dynasty lost very close matches against though opponents such as Los Angeles Valiant (2 – 3), Philadelphia Fusion (2 – 3) and London Spitfire (2 – 3). These close but unfortunate defeats are a testament to Seoul Dynasty’s capacity to hold its own against almost any adversary. Dallas Fuel seems to have reinvented its playstyle and has performed fairly well so far in Stage 4, winning against strong opponents such as London Spitfire and Philadelphia Fusion and being ranked 4th in the standings table. Compare this situation to its 1 V – 9 D result from Stage 3 and you can’t help but be impressed with how much a team can improve in such a short period of time. Going into this match, I think that Dallas Fuel has what it takes to walk away with a victory. Especially against this version of Seoul Dynasty. Betting prediction: Dallas Fuel at BetOnline.